The Brumby Chair Company | Thomas M. Brumby, Jr.
Thomas M. Brumby, Jr. became president of the Brumby Chair Co. in 1923 when he succeeded his father after he retired. He was the oldest of six sons and one daughter of Mariah Louise Bates and Thomas M. Brumby. Born in Goodman, Mississippi, on March 27, 1878, he moved to Marietta with his parents several months after he was born. He attended Marietta Public Schools, and as a youth started work in his father's chair factory. Having worked as foreman in every department of the sprawling factory and learned the operation of every machine, he was named secretary-treasurer at the age of 22 in 1900. In 1918 he was elected vice president and general manager and five years later became president. As the chair factory's third president, he greatly expanded the factory, making it one of the largest of its kind in the South and ushered it through the difficult Depression years. 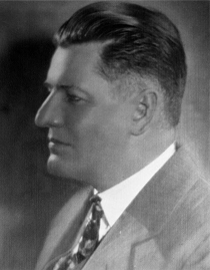 In addition to his business career, Thomas M. Brumby, Jr. had a highly successful public career and played a leading role in Marietta's development from the turn of the century until his death in 1938. He first served as a Marietta councilman from 1904-1906 and in 1929 was elected mayor and was serving his fifth consecutive term when he died August 20, 1938. On April 26, 1905 he married Cordelia Inman Gray, daughter of James R. Gray publisher of the Atlanta Journal. For 33 years they lived on Kennesaw Avenue in a house in front of the chair factory where they raised their four children: Mary Louise, Cordelia Brumby, Thomas M. Brumby, III and Richard G. Brumby. Active in civic life, he was a charter member and president of the Marietta Rotary Club and Marietta Golf Club. He was president of the Georgia Manufacturers' Association at the time of his death. Like his father, he was a lifelong member of the First Methodist Church of Marietta. He personally supervised construction of the Church annex in 1930. His father had been chairman of the building committee which constructed the main church building on the comer of Atlanta and Anderson streets in 1899. Tom died of an apparent heart attack August 20, 1938 at his summer home in Ponte Vedra, Florida, He was buried in St. James Episcopal Cemetery in Marietta where his mother and father were also buried. Reporting on Mayor Brumby's funeral in the Cobb County Times, Chess Abernathy wrote, Persons of high and low estate, both colored and white, crowded the church and lined the streets for a block as the Rev. Samuel M. Inman of Richmond, Virginia, conducted the rites for Mayor Thomas M. Brumby, Jr."